Hira Walraven, a joint venture between Hira Industries and Dutch manufacturer of pipe support systems Walraven, said its fixing systems division has opened a new facility at National Industries Park (NIP), thus consolidating its presence in the UAE. In the UAE since 1980, Hira Industries is one of the largest HVAC (heating, ventilation and air-conditioning) and construction materials distribution and manufacturing companies in the region, with 20 sales offices, 11 manufacturing plants and two showrooms across the emirates and the region. Thanks to its strategic location, the exclusive facility will be easily accessible to Dubai and Abu Dhabi, and will enjoy close proximity to the Al Maktoum Airport and the Expo 2020 site, said the company in a statement. Spread across a 6,500 sq m area, the Dh20-million ($5.4 million) facility is the only dedicated unit for fixing systems in the UAE. It will boast a central distribution warehouse and a factory to manufacture products such as pipe support clamps, support channels and rubber support inserts. The new facility was inaugurated by Ramesh Hiranandani and Jan Van Walraven in the presence of Hans Sandee, the consul general of Netherlands in Dubai and other senior officials. 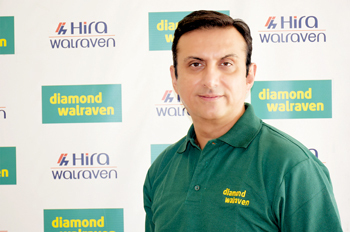 Speaking at the launch, Ravi Wadhwani, the general manager of Hira Walraven, said the new facility was a testament of Hira’s successful association with Walraven Group since past three years. “With this launch, we have not only consolidated our presence in the region, but also spearheaded our operations to supply quality products on time,” he added. A key highlight of the facility is the competence centre and the training room. Customers and employees will be able to see replicated installations of site using the complete product range. “The combination of our product system, know-how and services enable us to deliver smart product solutions. This is how we provide added value to our customers,” he added. Besides this facility, Hira Walraven has technical offices across the Middle East region, Indian subcontinent, Africa and South East Asia. As part of its expansion strategy, Hira said it plans to set up its fixing systems plants outside the GCC countries and add new products to its list catering to local taste.